It's been cold, grey and very wet here over the last few weeks, infact give or take a day or two, May was pretty much a rainy month! June has brought some lovely sunshine with her and I'm delighted! 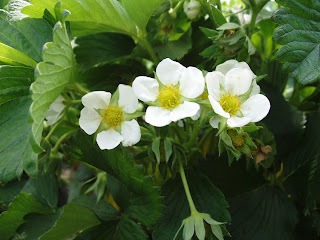 My strawberries are all in flower now and I'm excited at their promise of lovely fruit to come! Even the flowers look sweet and pretty don't they! Coo and I, have been taking things a little easier this week and spent some more time at home. The warmer weather makes him feel really tired so it's easier managed if we can stay home more, especially in the afternoons when he seems to tire most. I must say though, for someone who doesn't like gardening, Coo's been pottering around today! I'm hoping this gardening lark is a wee bit infectious as he sure could do with some fresh air around him! The sun so cheers and lifts the spirits doesn't it! It's just so soothing to feel it's warmth on your face! let's hope we all have some sunny days!